TOKOROZAWA, SAITAMA PREF. - Tadahito Iguchi couldn’t help feeling a sense of deja vu after the Chiba Lotte Marines’ destruction of the Seibu Lions in Game 1 of the Pacific League Climax Series First Stage on Saturday at Seibu Dome. After all, it was just a few years ago that the Marines blew into Seibu Dome as underdogs and upset the Lions to trigger a postseason run few Lotte fans will ever forget. So it was only natural on Saturday — after Iguchi’s three RBIs admist an offensive explosion and reliever Yuji Nishino’s great escape with the bases loaded in the fifth — that some wondered aloud if the Marines were about to do it again. If Saturday’s 11-1 is the start of something bigger, it’s likely the Marines will need the ever-reliable Iguchi to continue to play a leading role. The former MLB infielder was in the thick of the things in Game 1, homering in his first at-bat and driving in another two runs, accounting for three of the five runs Lotte had on the board by the fifth inning. “Everyone did their job setting the table, and I feel like I did my job,” Iguchi said afterward. Iguchi is coming off another solid season for Lotte, finishing third on the team with a .297 average while leading the way with 23 home runs and 83 RBIs. 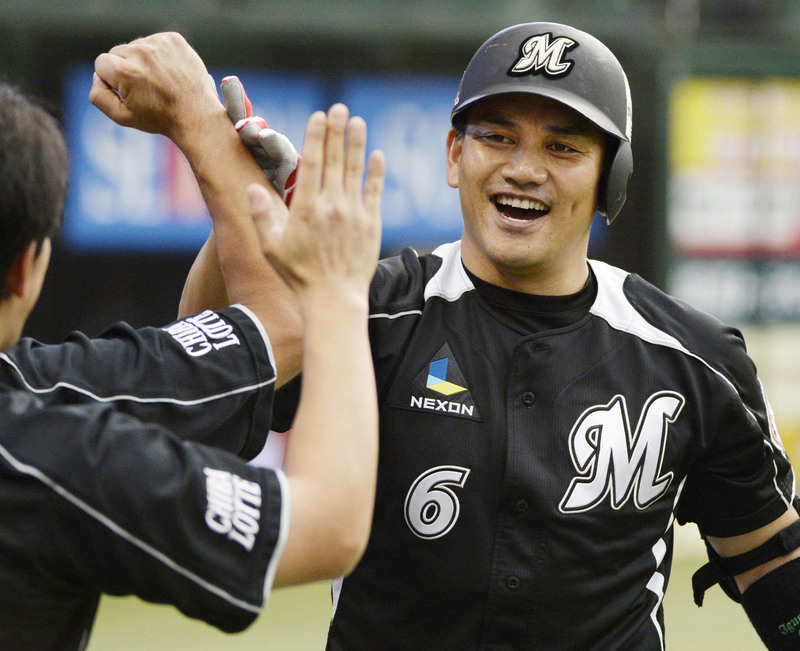 He was one of the key contributors on that 2010 title team, which shocked the Lions in the first stage and then, somewhat improbably, overcame the automatic one-game advantage the PL champion Fukuoka Softbank Hawks held to win the final stage and earn a trip to the Japan Series, where they vanquished the Chunichi Dragons in a tight seven-game series. Iguchi isn’t the only member of that team still around, but it’s undeniable that the Tokyo native knows more than most when it comes to championships. Iguchi was a part of Japan Series winners in 1999 and 2003 with the Fukuoka Daiei Hawks earlier in his career, and collected a pair of World Series rings as a member of the Chicago White Sox in 2005 and Philadelphia Phillies in 2008. He returned to Japan in 2009, winning that stunning championship with Lotte in 2010. His experience gives the Marines something to help guide them through the choppy postseason waters. A late swoon combined with the Lions reeling off eight straight wins cost Lotte a second-place finish and a chance to host the first-stage series, rather than playing at Seibu Dome, where the team was 3-9 during the regular season. Lotte controlled its own fate in its final game of the regular season but was mauled by the Lions 10-2 at Seibu Dome. “I thought after the final game that we would actually have an advantage by coming into the playoffs as the third-place team because we would have nothing to lose,” Iguchi said. That 2010 team had a heavy veteran presence and those players, Iguchi included, stepped up on Saturday to get the ball rolling again. Even so, Lotte remains wary about the remainder of the series against the Lions. 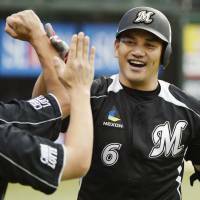 A win in Game 2 on Sunday, or Monday in Game 3, puts the Marines into the Climax Series Final Stage, where the PL champion Tohoku Rakuten Golden Eagles and their 24-0 ace Masahiro Tanaka will be waiting.